Lexington, KY - Bob Baffert, three-time Kentucky Derby-winning trainer, will be the online guest on Thursday, March 27, at noon ET, and on Sunday, March 30, at 2 p.m. ET, for this week's edition of BloodHorse.com "Talkin' Horses" www.BloodHorse.com/TalkinHorses sponsored by TrueNicks.com. Due to the large number of questions submitted, Baffert has graciously agreed to come back for an additional day. He is widely recognized as one of the most successful trainers in the history of horse racing. Baffert has been voted the Eclipse Award as the sport's outstanding trainer three times (1997, 1998, and 1999) and has trained nine Eclipse Award winners. In early 2008, Baffert-trained Thoroughbreds had earned in excess of $127 million to rank fifth among the all-time leaders. After becoming a top trainer in the Quarter Horse game, Baffert decided to become a full time Thoroughbred trainer in the early 1970s. Owners Mike Pegram and Hal Earnardt were responsible for bringing Baffert into the Thoroughbred racing business. Baffert also has trained for Robert and Janice McNair (Stonerside Stable); Ahmed Zayat (Zayat Stables); the late Bob Lewis and his wife, Beverly; the late Prince Ahmed bin Salman (The Thoroughbred Corp.); and the late John Mabee and his wife, Betty (Golden Eagle Farm). Silver Charm gave Baffert his first two Classic wins when he won the 1997 Kentucky Derby (gr. I) and Preakness (gr. I). He went on to win the 1998 $5 million Dubai World Cup, and retired with career earnings of $6,944,369. Silver Charm retired to stud in 2000. Baffert had another big year overall in 1998. Aside from winning the Dubai World Cup, Baffert won the Kentucky Derby and Preakness again with Real Quiet, who lost the Belmont Stakes by a nose. That made Baffert the first person in the history of Thoroughbred racing to train Kentucky Derby and Preakness winners in back-to-back years. In 2001, Baffert again won two-thirds of the Triple Crown, this time with Point Given, who won the Preakness and Belmont. Baffert won his third Derby/Preakness combination with War Emblem in 2002. He currently resides in Arcadia, Calif., along with his wife, Jill. He is the father of five children: Taylor, Canyon, Forest, Savannah and Bode. Questions for Bob Baffert can be submitted in advance now or during the online discussion by going to http://www.BloodHorse.com/TalkinHorses. The same Internet address will also carry BloodHorse.com "Talkin' Horses" webcast on Thursday. BloodHorse.com "Talkin' Horses" is sponsored by TrueNicks.com and offers an entertaining and engaging opportunity for racing enthusiasts to talk online one-on-one with high-profile insiders, newsmakers and legends of the Thoroughbred industry. Racing enthusiasts are invited to join in the discussion or simply enjoy and monitor the informative "Q&A" session as it occurs by visiting http://www.BloodHorse.com/TalkinHorses at noon ET on Thursday. Each edition of BloodHorse.com "Talkin' Horses" is archived online and available 24/7 for later reading. For more information, visit: http://www.BloodHorse.com/TalkinHorses. BloodHorse.com was voted the #1 horse industry Web site in 2007, 2005, and 2002 by the American Horse Publications Association, and was previously selected as a Top Seven Equestrian Web site by Forbes magazine. It is the preferred choice of industry professionals and racing enthusiasts alike for up-to-the-minute racing news and information. From award-winning, comprehensive editorial to fan-favorite Breeders' Cup and Triple Crown Mania channels and the engaging BloodHorse.com "Talkin' Horses" weekly feature, there is something for all Thoroughbred racing professionals and enthusiasts. 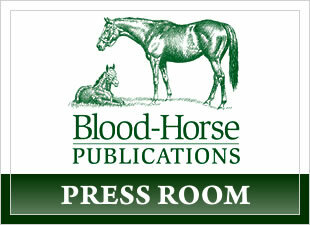 BloodHorse.com is operated by Blood-Horse Publications, the Thoroughbred industry's foremost publishing company. Blood-Horse Publications also publishes The Blood-Horse, the leading weekly Thoroughbred racing and breeding news and information magazine; the award-winning The Horse: Your Guide To Equine Health Care, a monthly equine health care magazine; TBH MarketWatch, a newsletter for Thoroughbred investors and recipient of the prestigious Awards for Publication Excellence (APEX) for 2006 and 2005; the official Kentucky Derby and Breeders' Cup souvenir magazines; Auction Edge; and Keeneland magazine. In addition, Blood-Horse Publications also publishes equine-related books and videos under the Eclipse Press banner, and operates a family of award-winning Web sites including TheHorse.com, StallionRegister.com, ExclusivelyEquine.com, the official store of Blood-Horse Publications, BloodHorseNOW.com, and the new TrueNicks.com.